Compare and contrast. Left: Hungry townspeople closing in on the lonely produce stall at my town's farmer's market. Right: One of many gorgeous, overflowing produce stalls at the farmer's market in Portland's south park blocks. I know that some parts of the country have really great farmer’s markets. I know this because I used to live in Portland, Oregon. The farmer’s market in the South Park Blocks while unappreciated by me at the time, would now rock my world. I also know this because I read food blogs whose authors live in large metropolitan areas or on the West Coast. These authors talk about the farmer’s market as being the cornerstone of their weekly food shopping. I live in a small town in Michigan. The farmer’s market in my town spans 6 or 7 booths. You’ll find a table or two of produce but generally the market sells stuff like quilted placemats in loud prints, homemade soap and baked goods. Even if I drive to the Ann Arbor farmers market, the “big” one around here, I wont find anything like those bountiful, lush produce stalls full of interesting and inspiring vegetables that I remember from Portland. I may have audibly sighed the other day when I read Mark Sissons post at Marks Daily Apple about primal gazpacho. He writes, “I headed down to the farmers’ market for some bulbous, dark red heirloom tomatoes. Three large ones did the trick. I also picked up some parsley, Persian cucumbers (seedless, fresh oregano, green bell pepper, red onion, and cilantro.” Heirloom tomatoes Persian cucumbers Okay, I’m jealous. So what’s a primal eater to do if the gas station in town rivals the farmer’s market in fresh produce I suggest looking into CSA Farms in your area. CSA stands for Community Supported Agriculture. You pay a certain amount at the beginning of the season and then you receive a share of the crop weekly throughout the growing season. I pay $500/year and every week in late May-early October I receive a huge box of fresh, delicious, and occasionally unusual produce. I pick up my share box directly at the farm on Wednesdays. The kids come with me and they get to explore the farm, watch the chickens, and have a ‘farm snack’ from the share box on the way home. #1: Be prepared to spend some serious time each week washing your produce, especially during lettuce season. The produce might be dirtier than youre used to. I’m always happy to wash off real DIRT in lieu somebody’s germy handprint from the supermarket. Regardless, nothing will guarantee that your bundle of bitter greens will rot away in the back of your fridge like leaving it untrimmed and unwashed. #2: When you’ve got this much produce on your hands, it’s best not to think about how you will incorporate a little here and there into your weekly primal menu. The produce IS your menu, and other foods are along for the ride. I have 8 heads of lettuce and 3 bundles of spinach in my fridge, and 5 days until I get my next share. This is not the time for “side salads”. #3: Get some of those bags that extend the life of fruits and vegetables. This way, even if despite your best efforts you couldn’t get around to the spinach, it wont go to waste before you can freeze it. #4: Be open to expanding your vegetable horizons. I think this is the fun part. You’ll get stuff in your share that you wouldnt normally buy (like tatsoi, or garlic scapes and you’ll have to figure out how to eat it. If you don’t think youll be able to eat your whole share, you might want to look into how to freeze or otherwise preserve what you get. I recommend getting a cookbook that deals exclusively with vegetables. I have to drive 20 on the expressway minutes to buy organic produce in a supermarket, but I am surrounded by CSA’s. Especially if you live in the Midwest or Eastern U.S, this may the case for you, too. 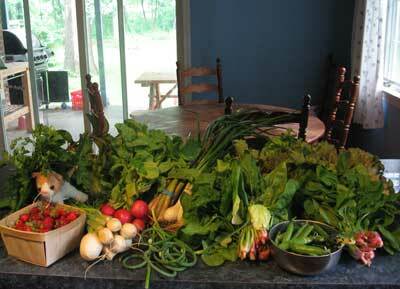 You can go to this cool web site, local harvest, to see if there is a CSA near you. Wow! I’m amazed by the Portland farmer’s market photo. What rhubarbundance! Even with half a share, I completely agree that “pre processing” all of the organic vegetable goodness (washing it, portioning it) is helpful to actually using it on a busy weeknight. I try to do a bunch when the share arrives, and then process a bit more when the first washed bits get eaten up! Hi Dunrie – thanks for popping by. I thought taking on a full share would be a good summer challenge. I still have trouble incorporating some of the greens from the root veggies, but I guess it is good to leave room for improvement for next year! Greens from root veggies: I highly recommend green smoothies! Also, I was you love Stumptuous too. Fabulous site! Do you think CSA non organic produce is a better bet over organic supermarket produce? Would love to know your take on this…..